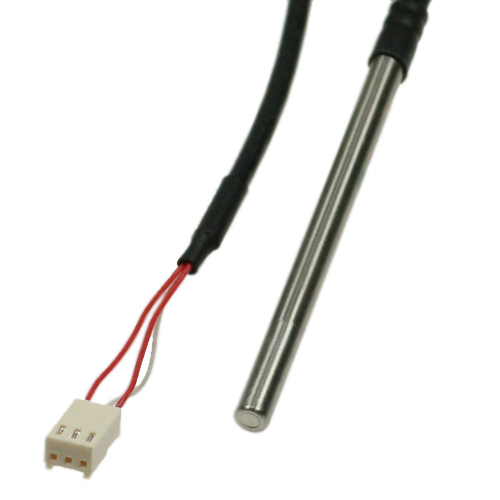 The cable probes with digital pre-calibrated sensors from B+B are suitable for the temperature measurement in liquids and gaseous media. Ideal area of application are heating, cooling and air conditioning technology as well as building automation. The measurement of temperature with this TSic™ Cable probe is very easy. In the temperature range between +10 and 90 °C it delivers measurement within an accuracy of ±0,3 K, which is more accurate than a platinum sensor class B DIN EN 60751. The sensor element is protected by stainless steel tube and is connected to a 4 meter long silicon rubber cable. The probe fulfil the requirement of the IP67 ingress protection index (dust and water tight). The calibrated measurement values are digitally transmitted under a ZACWire (OWI) interface protocol which is very easy to interpret with a microcontroller. Alternative the use may use the B+B TLOG 4 USB system to monitor or log the measured values directly on a PC The TSic™ temperature sensors are used in building automation, medical technologies and in machine construction. Due to the low power consumption they are also suitable for mobile applications.